Wow. Your work is technically gorgeous, a bit haunting, and incredibly imaginative. I wanted to climb through and explore your tokoekas riddled cave. And the welcome home Bianca illustration is so precious. this is amazing! you are so imaginative and depict all the power of the scene with the most minimal detail...absolutely wonderful! Your illustration is wonderful, poor bunnies, hope everything works fine for them. Fabulous!! hope these bunnies have ventured well thru the deserted city. Wow, great Ghost Town! I half expect zombie bunnies to come shambling out the ruins any moment now. I love the way you keep the characters so simple against such a rich landscape, and somehow make both so emotive. BTW, thanks for the comment! I had to look up "caldera", which is a little embarrassing. very fine...it has a haunting gentleness. Wow, what an amazing detail drawing! This word has me totally stumped for this week! I'm glad it's inspiring to so many others. Great work! Fantastic illustration style! I really like your toad, too! Please do tell - did it go well for your fur-bearing friends? They have a star-in-a-jar, so I figure that all is well. Now the question I'm sure many are wondering about; have you considered a children's book? Of course you have. It would just have to be sooooooooooooo good, a delight for big and small! Your illustrations are amazing, can't wait to see you on Amazon. love all the detail. and the humor. very wonderful illustration. thanks for commenting on my piece.. but Wow, Your work is amazing! technical question, do you do your inking on paper or on the computer, it's just all so perfect. Cheers everyone for the great comments! Looks gorgeous! Those little bunnies seem lost in the streets of a big city. Holy moly. Your illo is awesome and so is all the work on your site. Thanks for visiting my blog and introducing me to all of your amazing work. Amazing, I love the details. (Actually, all your works are amazing and full of details :)). A bit scary too, I hope the bunnies will be OK. I really like the way you draw them, they are so full of expression. Wow you have a unique style, full of details, and those little cute bunnies... are gorgeous! amazing Emily. As always visiting your blog with pleasure. WOW, love the urban decay/blight, hope Zoe and Dante make it through alright. Love the detail in your work, still my favorite! WOW, what a discover! This is one of the most shocking, technical, beautiful, amazing and perfect things I've seen for ages!!! Cool, unsual, and different style. Extraordinary work as always. Are your bunnies for publication? ur work is simply amazing... i am in awe. Yeah, I agree they must be caution at all, just like your caution inking your artwork. Many happy return seeing work done. He..He.. Oh Emily, I am a certified broken record. The only difference with each visit is that my feelings for your incredible art are magnified. Your lines are priceless. I lovelovelove the detail. Beautiful work. Yesterday my mom called me up from the other end of the country telling me she loved your work!! 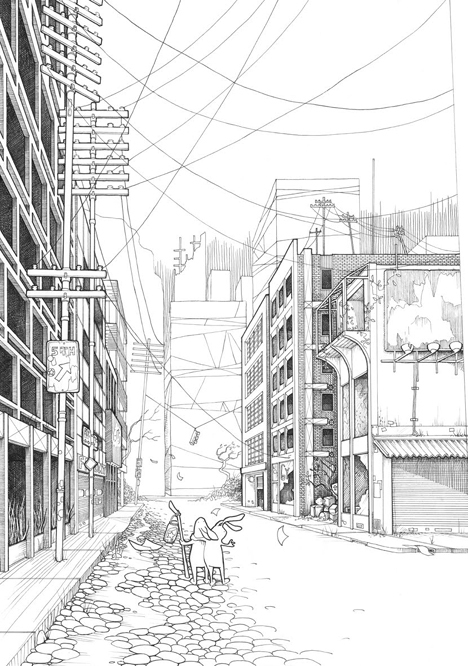 Love the urban landscape and linework!!! !